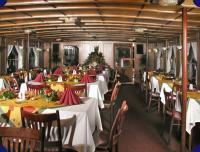 Dinner on the Vltava Steamer (all-inclusive) - TBS - travel agency for all your travel needs in the Czech Republic! A 3-hour panoramic sail including dinner. Refreshments during the cruise are included in the price.